Throughout the summer season, you receive 8 to 10 items including “staple” items like onions, carrots, tomatoes, potatoes, garlic, lettuce etc. and a diversity of delicious seasonal veggies (such as bok choy, fennel, kohlrabi, hot peppers and much more). 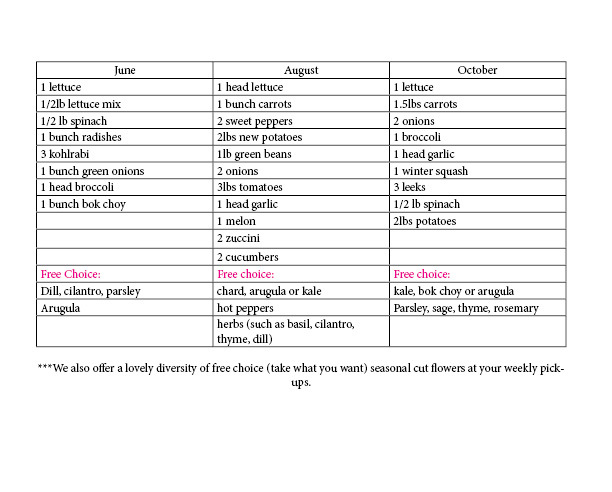 All veggie offerings are season-dependent but you are guaranteed lots of diversity and deliciousness every week! The following are examples of what might be in a REGULAR summer share at different points in the season (note that the makeup of the shares varies slightly year to year). Large shares contain the same number of items but 1.5 to 2 times the amounts of most items. We make as many items as possible tradeable so that you can leave things you do not want and take more of what you do want. The amount of “Free choice” items you take each week is up to you (a weekly amount, not for preserving!). A regular Winter shares consists of a core bi-weekly share of 3lbs carrots, 3lbs potatoes, 2.5lbs onions and 2 heads of garlic. Added to that each week is 3-4 additional items of some combination of 2.5lbs beets, 2lbs parsnips, 1 cabbage, 1 large kohlrabi, 1 napa cabbage, 1 celeriac, 1 rutabaga, 1 winter squash, 4-5 shallots, 3lbs sweet potatoes. 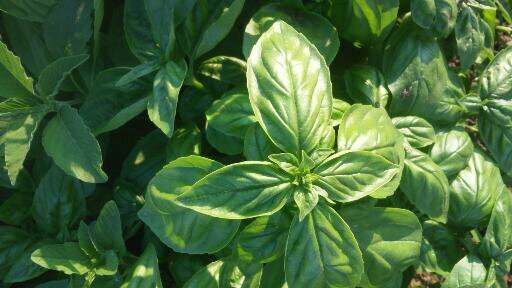 On top of that you receive 1-2 types of greens – spinach or kale, endive, lettuce, arugula, mustard greens and more! Like in the summer, the Large share contains the same number of items but 1.5 times the amounts. Our spring share is a single size and is made up of 4-5 items of a mix of the following: 1/2lb lettuce mix, 2 small lettuces, 1/3 lb arugula, 1 bunch bok choy, 1 bunch of radishes, 1 bunch of kale, 2 endive, and other early spring greens!